Established in 2002, Dogtown artist Wes Humpston has brought his considerable talent to the new age of skateboarding.� Using unique, custom molds to create old school decks with new school flare.� Made 100% in the USA with quality and customer service second to none. 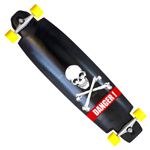 10.875" x 43.75" 34.75" Wheel Base Concave Downhill Speed Board Price is for deck only. Please contact us about great complete pricing. Collector Deck / Wall Hanger / Slight Warp 8.375" x 32.25" 14.75" Wheelbase 6.625" Tail, 6.875" Nose Double Kick, Concave Released around 2007.